Retailers have been stealing ideas from online rivals about how to run websites for years. Now they are borrowing ways to run brick-and-mortar stores. In Manhattan Beach, Calif., Macy’s Inc. revamped its swimsuit and workout sections this spring to display only samples, a strategy used by online retailers that have opened physical stores. Instead of stuffing racks with every size and style in these departments, Macy’s displayed only one item of each style. Shoppers used an app on their mobile phones to alert Macy’s sales staff of the style and size they wanted to try on and that item was sent to a specified dressing room. 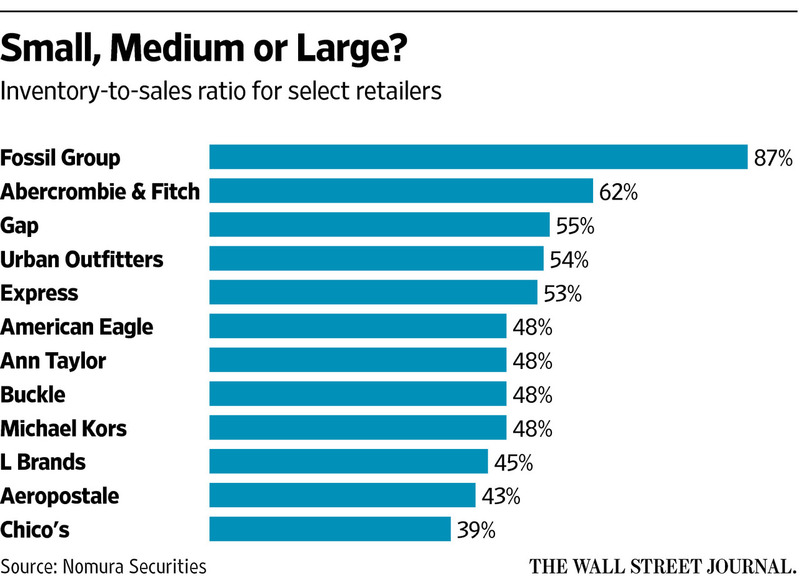 By not putting all the sizes on the sales floor, Macy’s was able to display more styles and avoid the tangle of hangers. Shoppers didn’t have to go back and forth into the fitting rooms to find the right size. The effort sought to marry the ease of online with something the Internet can’t offer—the ability to see, touch and try on goods. Traditional retailers have been struggling to figure out how to manage their e-commerce operations alongside their giant networks of stores without using two sets of inventory. One solution has been to use the merchandise in their stores to fulfill online purchases but that strategy still isn’t as efficient as the centralized distribution centers that e-commerce rivals use. Inventory is no small thing for retailers. It is often the single largest cost as a percentage of sales for retailers, according to Simeon Siegel, an analyst with Nomura Securities. Web retailers like men’s clothing company Bonobos Inc. and diamond jeweler Blue Nile Inc. that made the jump from the digital world to the physical one are approaching bricks and mortar without giving up their inventory advantage. At Bonobos stores, shoppers can browse and try on different styles in any size, but they can’t take home their purchase then and there. Instead, they need to order online. This model allows Bonobos to keep its merchandise at centralized distribution centers, so it can buy less overall and turnover the goods faster. Bonobos has now opened 19 stores, including a 4,000-square-foot flagship on Manhattan’s Fifth Avenue in June. The risk is that shoppers who make the effort to visit a store won’t have the instant gratification of walking out with their purchase. Mr. Dunn said that this style of shopping appeals to men, who often don’t want the hassle of having to lug around a shopping bag. He added customers seem to value getting the correct size, product and personal service over instant gratification. Blue Nile is following a similar model with what it calls “web rooms,” the first of which opened in June at the Roosevelt Field mall in Garden City, N.Y. At less than 500 square feet, the web room is about one-sixth the size of a typical jewelry store. Shoppers can try on 300 sample rings and then work with a stylist to pick a stone from one of the 200,000 diamonds Blue Nile displays on its website. Blue Nile Chief Executive Harvey Kanter said the company is able to turn its inventory about 11 times a year compared with about twice for a typical jewelry chain. And Blue Nile doesn’t have as much risk because it waits for a customer to place an order before taking possession of the goods, reducing its working capital needs. Encumbered by legacy assets, most brick-and-mortar retailers don’t have the luxury of reinventing stores from scratch, so they are borrowing some techniques from the online world. At 29 Target Corp. stores around Denver this spring, the retailer turned its displays of patio furniture into showrooms. Shoppers could browse floor models but could buy them only online, either from their mobile phones or personal computers, so Target didn’t have stock the bulky items on site. By stocking less inventory in the stores, Target could display pricier floor models, which helped sales of patio furniture at the 29 test stores clock a percentage gain that was double the chain-wide average, according to Eddie Baeb, a company spokesman. The sales bump came with a cost reduction because Target doesn’t have to distribute the bulky items to its stores. The retailer is now considering expanding the effort to household furniture. Boston Proper, which is owned by Chico’s FAS Inc., carries between half and two-thirds of its merchandise in its stores, which are about half the size of a typical women’s clothing retailer. It then encourages shoppers to browse a tech table stationed by the dressing room with tablets that display the full assortment and offer style tips. About 15% of the retailer’s sales come from purchases made online at its stores, according to a person familiar with the matter. The Macy’s test allowed it to display more items on the sales floor while also adding features to the dressing rooms. Shoppers used a Macy’s app to scan the bar codes on the tags of styles they liked. Sales associates, once alerted, grabbed the chosen goods from a nearby stock room and dropped them into the fitting rooms through hatches. The app notified the shopper which fitting room to go to. And new sizes and styles could be requested from tablets in the fitting rooms so shoppers didn’t have to get dressed again to search for different styles or sizes. To set up the project, the retailer tapped former Amazon executive Nadia Shouraboura,who now runs a company that develops technology for physical stores designed to make the hunt for merchandise easier. Jim Sluzewski, a Macy’s spokesman, said it was too early to know whether the test, which concluded in recent weeks, will be expanded. But shoppers seemed to like it.